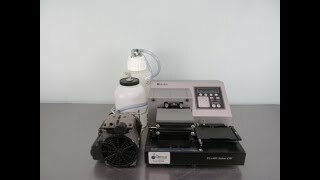 The Biotek ELx405 Microplate Washer provides you with reliable washing, dispensing and priming functions of 96 and 384-Well Microplates. This programmable and fully automated Microplate washer features a dual action manifold with 96 sets of dispense and aspirate tubes, and allows you to control flow rates, volumes for a wide range of gentle to vigorous washing capabilities. This Microplate washer can handle washes for all Microplate assays from fluorescence, chemiluminescence, RIA, DNA probes and cellular assays. The ELX405 Microplate washer can be operated from the intuitive digital display screen, and parameters can be set through the on-board menu driven software, with simplified pre-defined, programs for wash, prime, dispense and aspirate, even linking up to 10 programs together to run one after another. The onboard software will even store up to 75 programs. The Biotek ELx405UCW Microplate Washer has built-in fluid flow, fluid detection and vacuum sensing, protecting the instrument and your samples during unattended periods. This Biotek plate washer is also Biostack compatible for full automation. This Microplate washer a feature a series of pre-defined preventative maintenance programs to keep your instrument in tip top shape and ready to go. This Biotek ELx405UCW Microplate Washer has been fully inspected and is performing to expectations. All of our lab equipment comes backed with our standard warranty. Should you have any questions, please don't hesitate to contact us.